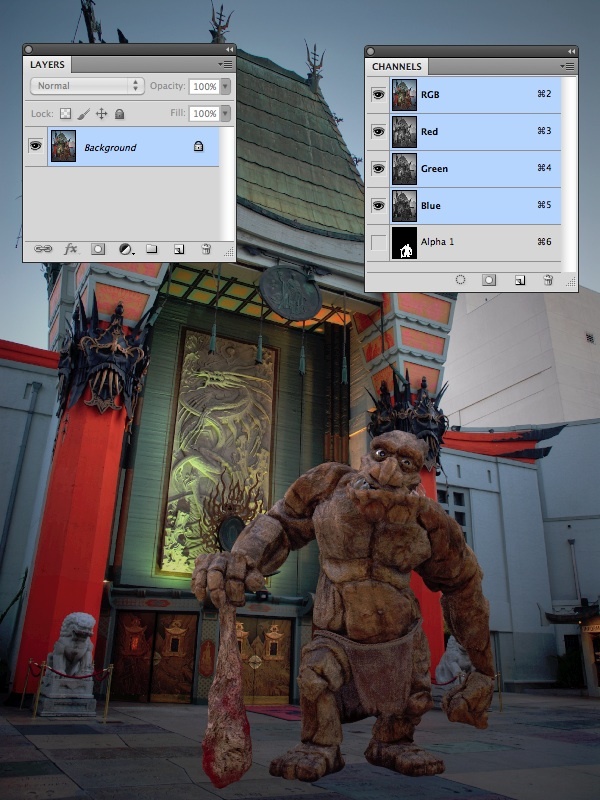 Adobe just released a new OpenEXR file format plugin, that changes the way Photoshop deals with an Alpha channel. It used to load them as transparency, which looks like this. Well, that may be fine for many photographers, but certainly not for panorama shooters and VFX artists. The problem is that Photoshop actually cuts the transparent parts away during loading. But sometimes you still want to do some painting on the Alpha mask before applying it as transparency. Panorama photographers do that a lot. Or you might just want to use the Alpha as selection, to treat foreground and background separately. This is in fact very common in VFX work. So, the default cuts the background away. Get Adobe's OpenEXR Alpha plugin and it doesn't do that anymore. There was actually a historic thread about this issue in the Adobe forum. It became pretty heated when Adobe engineer Chris Cox started schooling customers about what an Alpha channel is (despite the fact that the bug reports came from Pixar and other leading VFX houses). It's a very technical thread, not an easy read. But it became hilarious when Mr. Cox kept referring to the official Open EXR specification, to proof the point that Photoshop does it right and everybody else does it wrong. Turned out the gentleman he was arguing with was Florian Kainz from ILM, the original inventor of the OpenEXR format, who promptly replies "Reload that OpenEXR specs page, I just clarified it for you." Epic. Of course, this doesn't really affect users of ProEXR, because they had this option for years. As a reminder, if you hold the option key while loading an image, ProEXR will come up with this options panel. But the good news is, if you have no need for layers, snazzy compression schemes, or full 32-bit precision, then you don't have to buy ProER anymore. 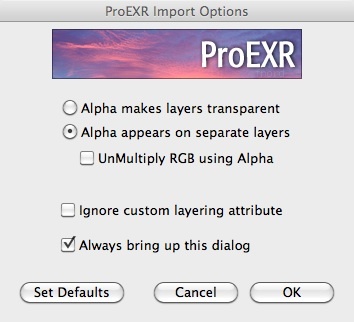 Photoshop's free OpenEXR Alpha plugin at least takes care of the most annoying shortcomings. 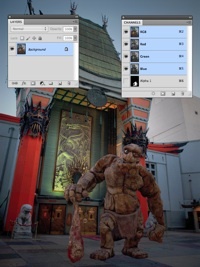 Now you can save an Alpha channel in your EXR, that PTGui can use as blending mask during pano stitching. 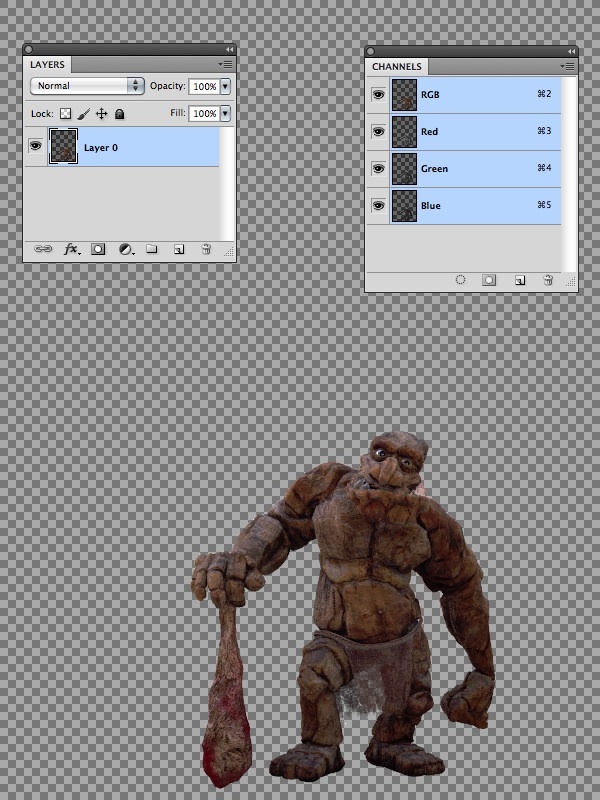 Or you can load a 3D render, where the Alpha is used to separate background and foreground.